Cheers to Friday, friends, and the weekend ahead! Our teen is away on a camp retreat, so Little Miss and I are meeting Mama Sugarplum for a girlie day of lunch and Mary Poppins tomorrow. Have you seen the new version? I’m always down for movie popcorn, so it’s a win either way for me! 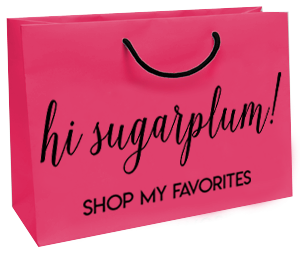 Thank you again for your love on this week’s announcement of the Gibson x Hi Sugarplum Resort Collection, along with Winter Cozy styles and the Guest Room update! It’s hard to sit on opposite sides of the computer sometimes, so I always love hearing from you! 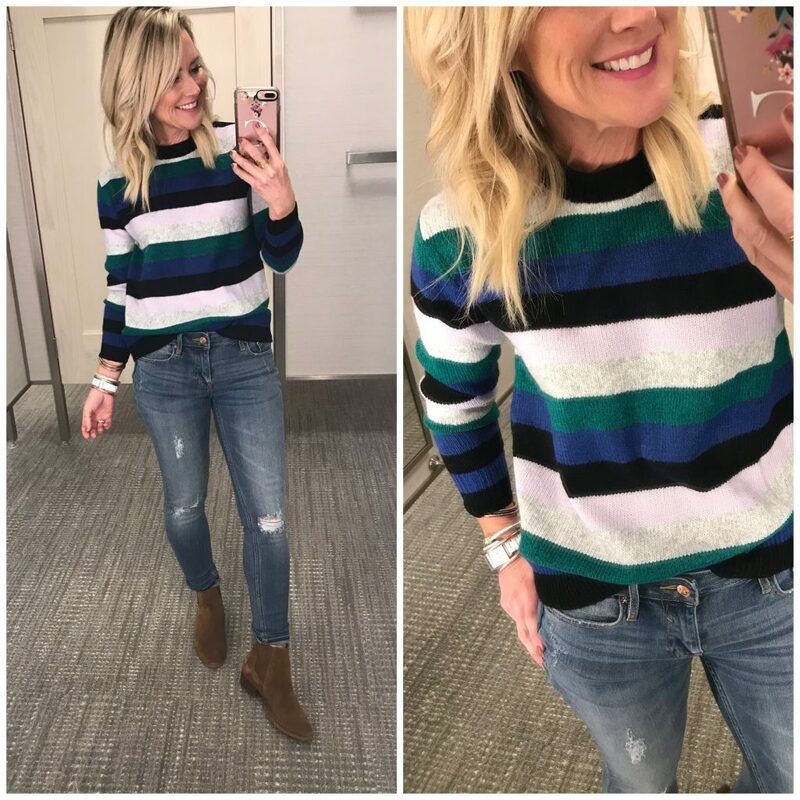 Today I’m excited to bring you the first Dressing Room Diaries of the New Year, and it’s a good one with so many great finds for the season. The biggest takeaway from this week’s finds was all the great colors! It’s like brands realized we’re all tired of the dull, gray days of Winter, and started infusing happy color. We’ve still got several months of cold ahead, which isn’t so bad when you’ve got cheerful color in your wardrobe. 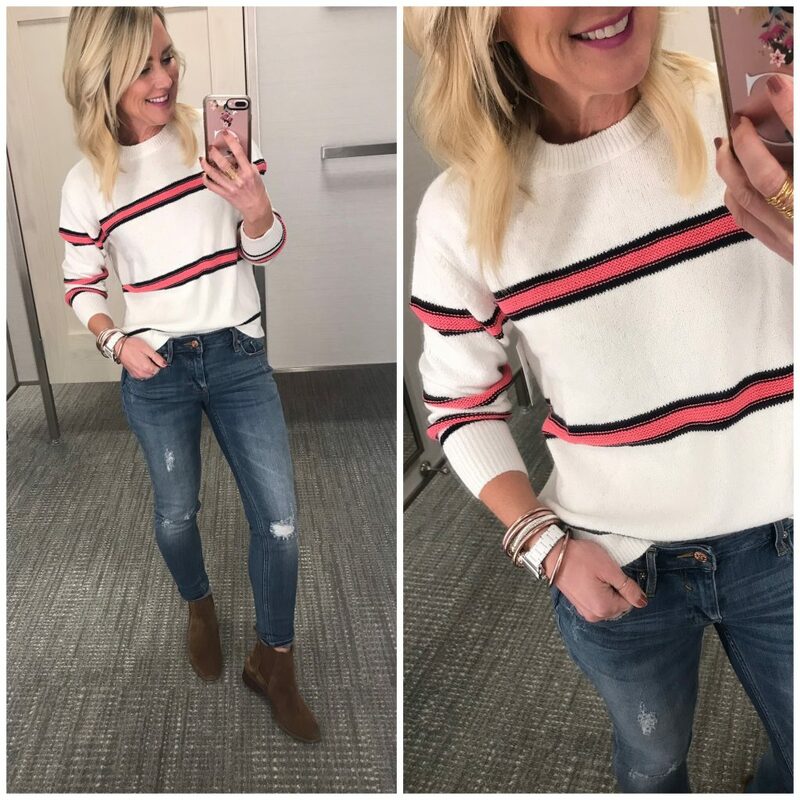 Staring with this striped sweater! 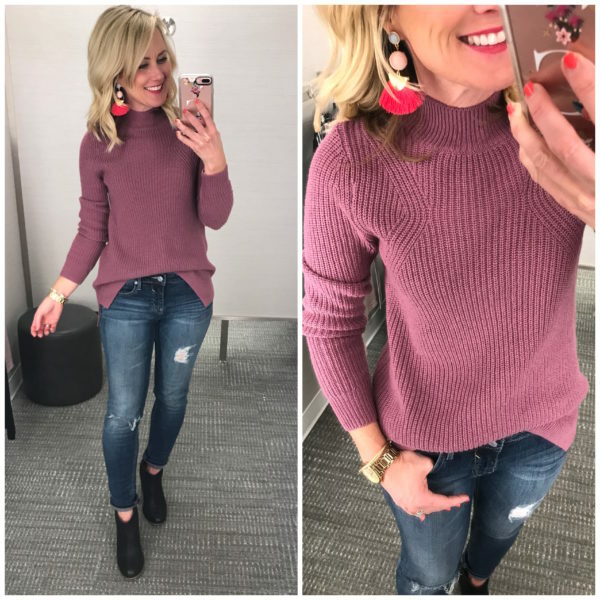 I love the funnel neck, and relaxed fit, plus the colors are some of my faves. 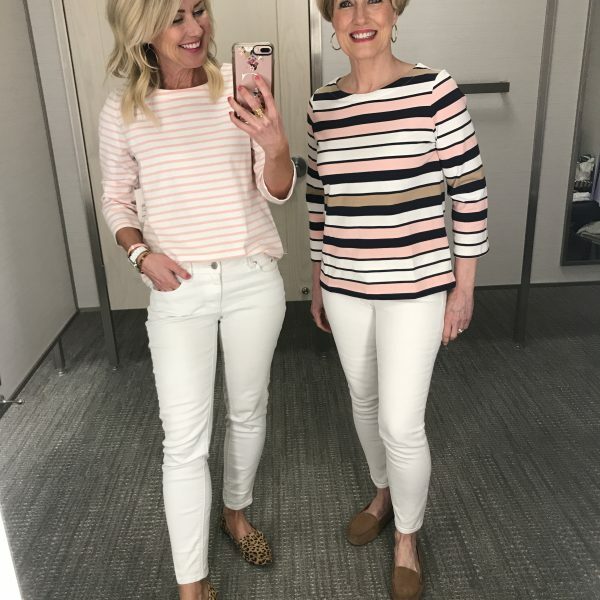 It’s about hip-length, and looks cute with a half-tuck. I found it a little scratchy, but nothing a layered tee didn’t fix. 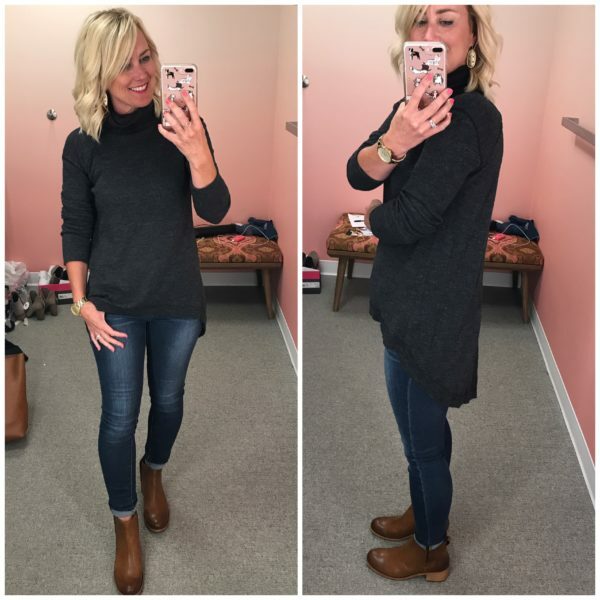 Fit Tip: I’m wearing an XS, and it’s a great, oversized fit. Size up one if you want to wear it as a tunic with leggings, or size down if you prefer a tighter fit. Okay, back to sweaters! 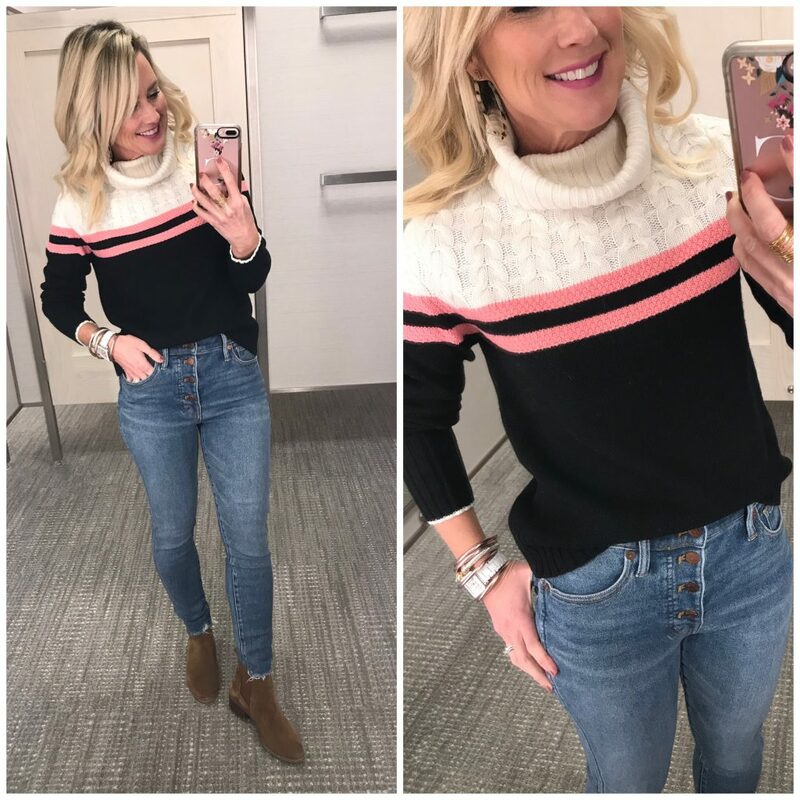 How can I not love a sweater with a pop of pink? Love the black and ivory color block, and the touch of pink just makes it so happy and preppy. The cable knit is soft and stretchy. 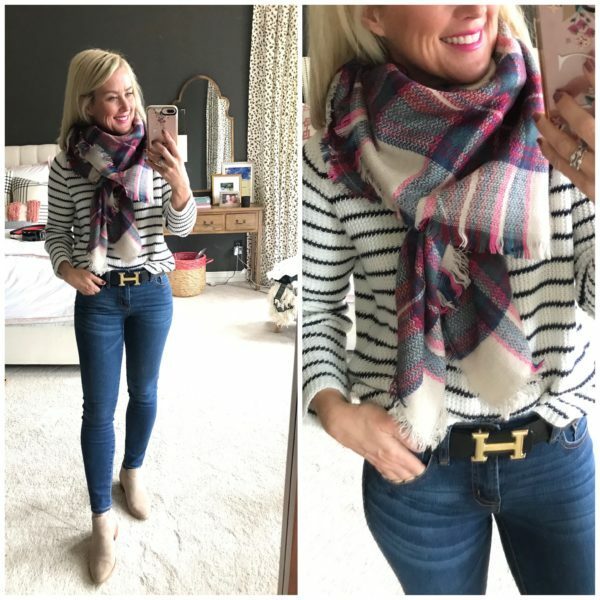 More pink stripes…are you seeing a theme here? 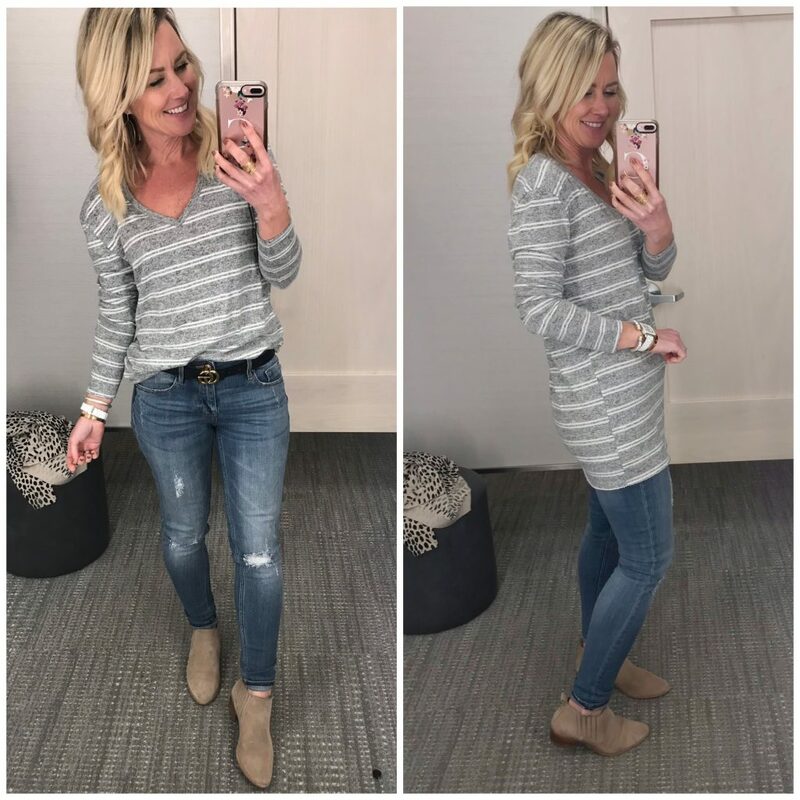 This sweater is lightweight and soft, and while it’s on the thinner side, it doesn’t require an under layer. It’d be cute with a pink or navy gingham collar peeking out, don’t you think? 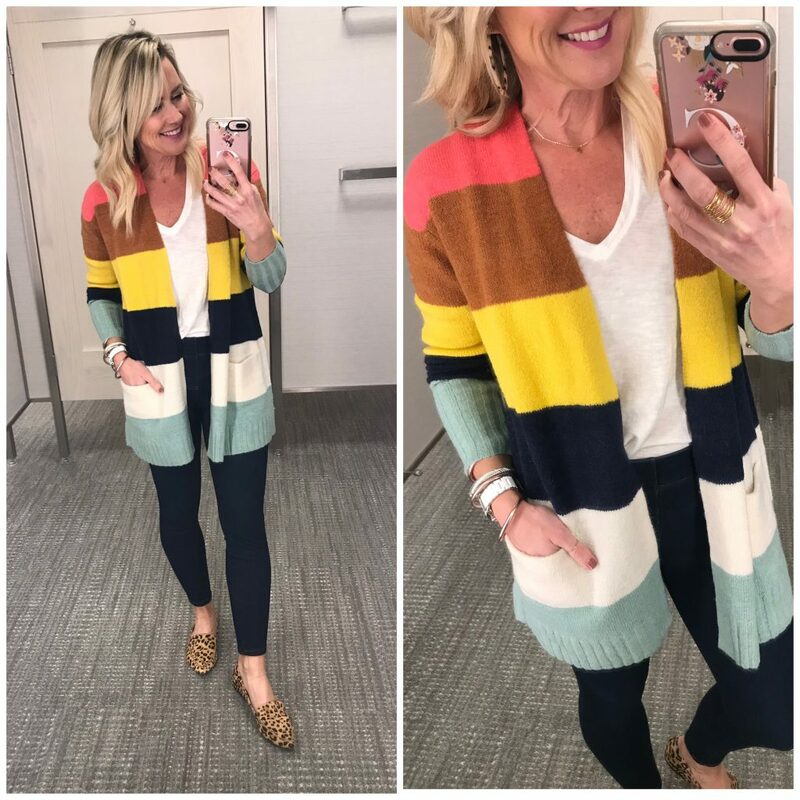 It’s a great transitional sweater into Spring, too. 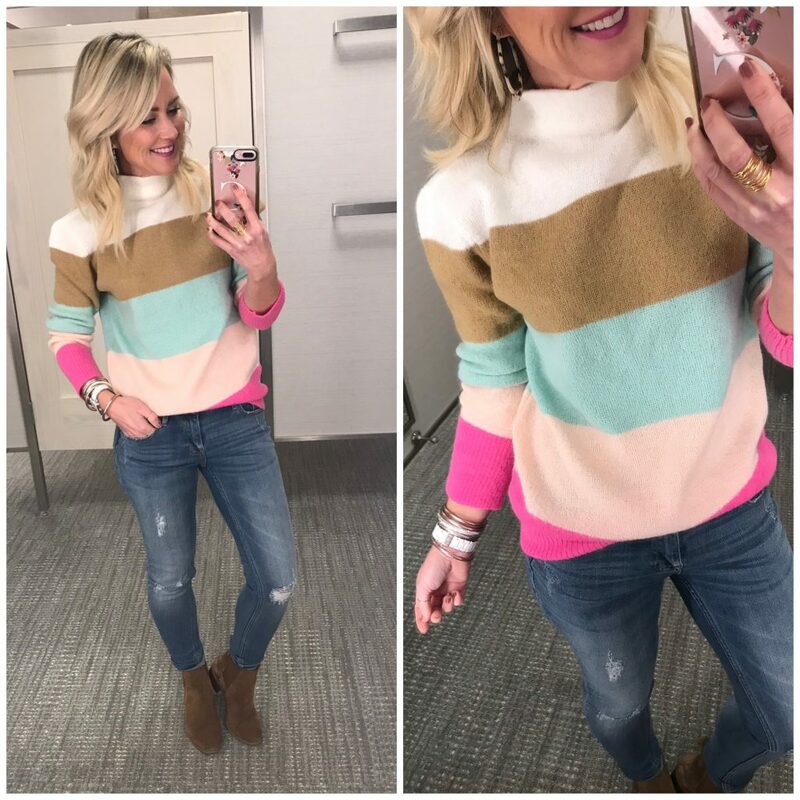 Another favorite this round…adore the combo of colors in this pretty sweater. But as if the stripes aren’t cute enough, it has a darling tie-back with ribbon at the neck (see it here). It comes in tons of solids and stripe combos, and would dress up or down, making it a great workwear staple. It’s been unseasonably warm here lately, so I’ve reached for this new short-sleeve sweater a few times! It’s a lovely winter white, with the cutest embroidered dots (they’re actually raised, almost like mini-poms!). The puffed sleeves makes it extra feminine, and perfect with jeans, trousers, or a pencil skirt. 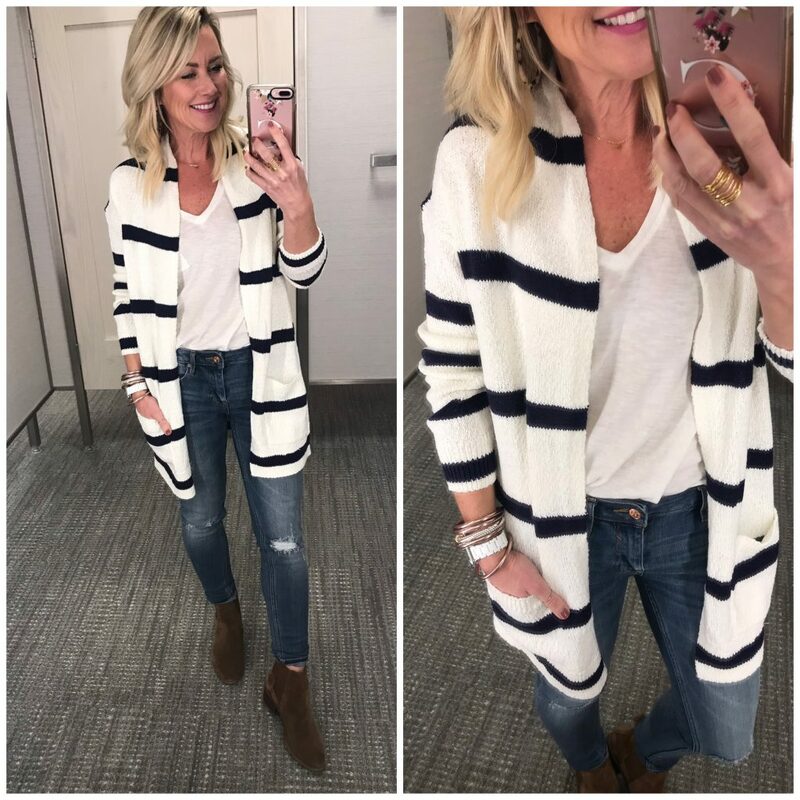 Okay, let’s move on to a different style of sweater…the long cardigan. Of course they’re still striped! (Did you expect anything different?!) This one is relaxed and soft, with cute front pockets. It’s a wool-blend, so it’s warm, too. I love it, and that’s all I have to say about that! 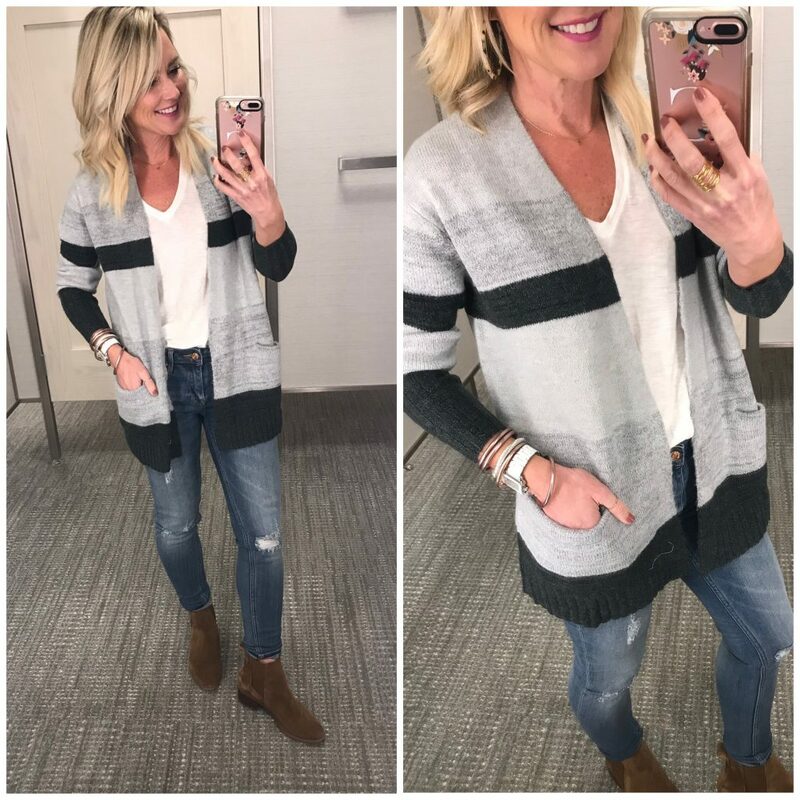 This cardigan is more of a cotton-blend, so it’s light and soft…a great transitional sweater. Plus, the black and white stripes are so versatile for pairing with all kinds of shirts (tees, chambray, plaid, gingham). 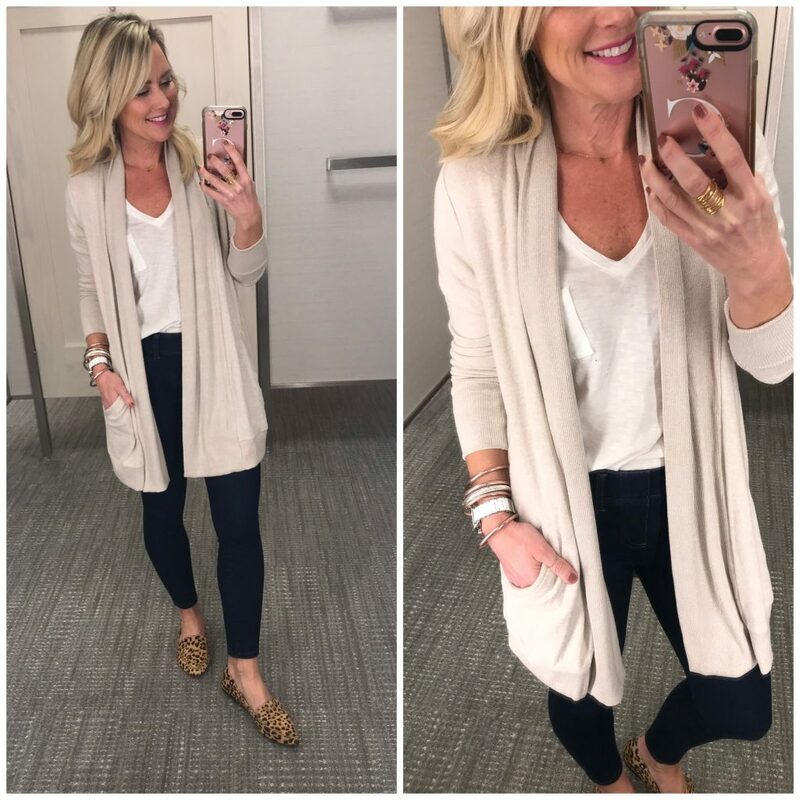 If soft is what you’re looking for, my friends at Gibson just released this draped cardigan that’s pajama comfy! It has a draped, shawl collar and deep side pockets. It’s also a great length for leggings. Dresses are tricky this time of year because it’s too cold for exposed legs, and tights tend to mess up the outfit…unless it’s a sweater dress! I love this style with tights and block-heels, flats, or booties. Plus, the fit-and-flare shape is flattering and feminine. It comes in this wine or black, and is currently on sale! If you’re looking for a dressier style, I loved the jacquard pattern and feel of this ruffle sleeve dress. Just a touch of an a-line shape, so it’s flattering and comfortable. It would be really chic with black tights and block-heels (love these) if needed, too. Okay, let’s get back to cozy. Funny enough, I’ve tried this pullover before…and while I loved the style, I didn’t love the fit on me. Turns out, I just needed to size up!! Now I adore it!! I mean, what’s not to love…super soft and plush, zipper collar, and cutest embroidered heart. I’ll wear it with jeans, joggers, and pajama pants. I’ve had this cozy fleece pullover for a few years, but couldn’t resist the striped version when it marked down to $15! 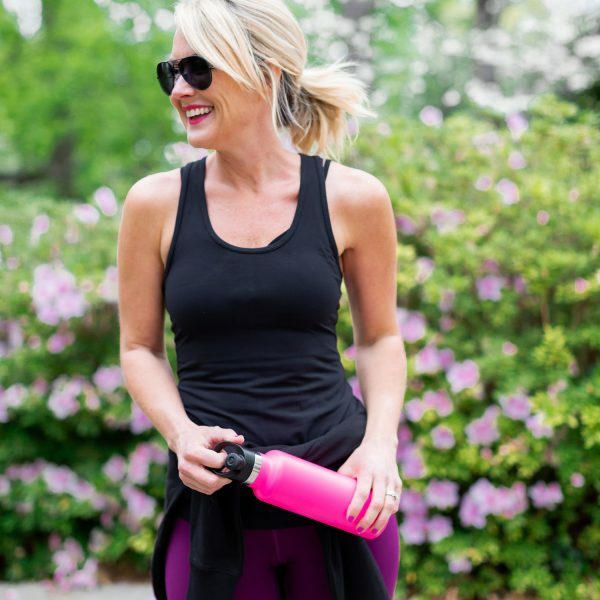 Fit Tip: I’m wearing XS, but size up one if you want it fuller through the body to wear with leggings. 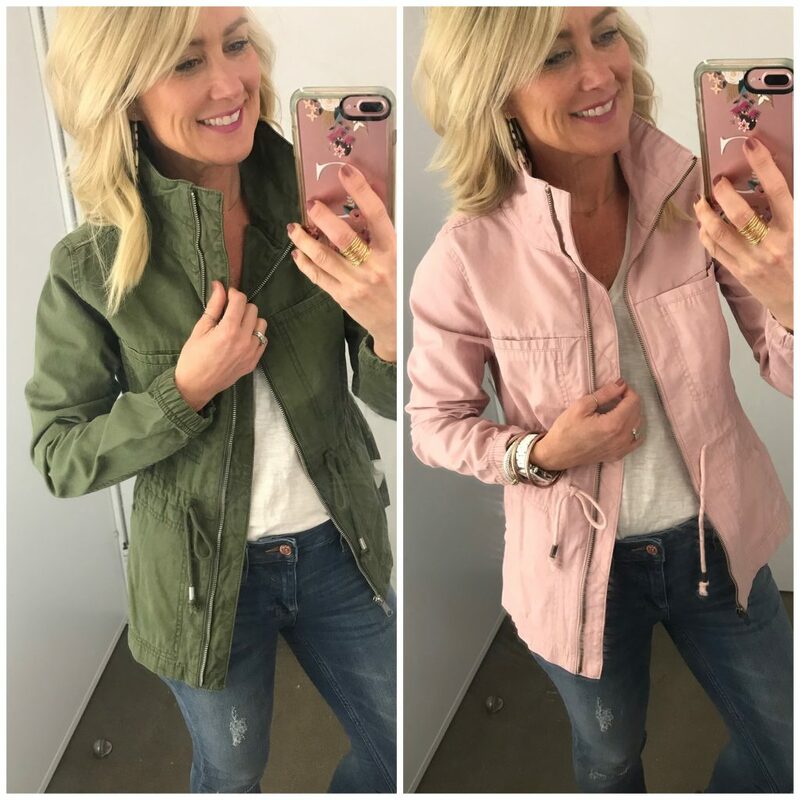 Fit Tip: I’m wearing a small in the olive and XS in the pink…so size according to the fit you prefer best. 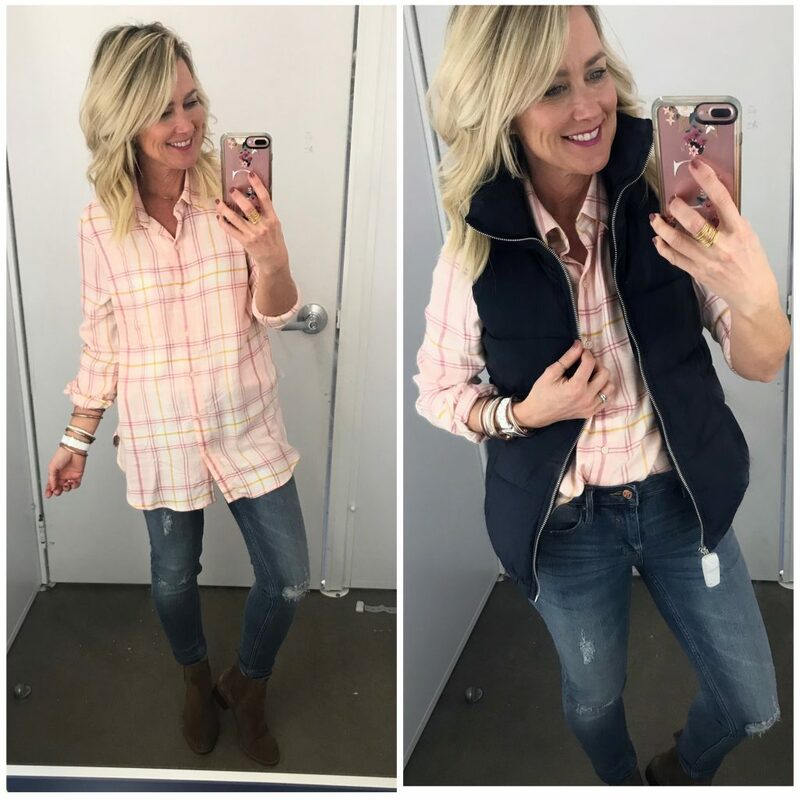 One of my go-to casual outfits this time of year…soft plaid and puffer vests. I love the brushed twill of this shirt, so soft and cozy! Plus, it’s longer and great with both leggings or jeans. And I have these puffers in almost every color, so clearly I’m a fan. Fit Tip: I sized up to a small in the shirt for a longer tunic fit, but wearing XS vest. And finally, Valentine’s Day is around the corner…and while you won’t see me sharing ‘sassy pajamas’, I did find two really cute options! Let’s be real, this shorts and tank combo is about as sassy and I get anymore! But actually, I love this tank for day-wear, as well! So cute under a blazer! Fit Tip: The tank is TTS, I’m wearing XS, but the shorts run small. I’m wearing a small, but would prefer a medium. If you prefer to be a little more covered up, this black and white heart set is darling!! Soft jersey knit and perfect mid-weight. Fit Tip: They run really small, I sized up one and they’re still a little snug across the bum. But I do like that they aren’t super long! Okay, that’s it for today! I do hope you found this post helpful, and maybe discovered some new goodies. Oh, and did you notice my fun little arm party going on?! I’ll share more in my next Amazon Fashion Finds soon, but this cuff and this bangle are now part of my daily combo! What’s your favorite from this round of Dressing Room Diaries? 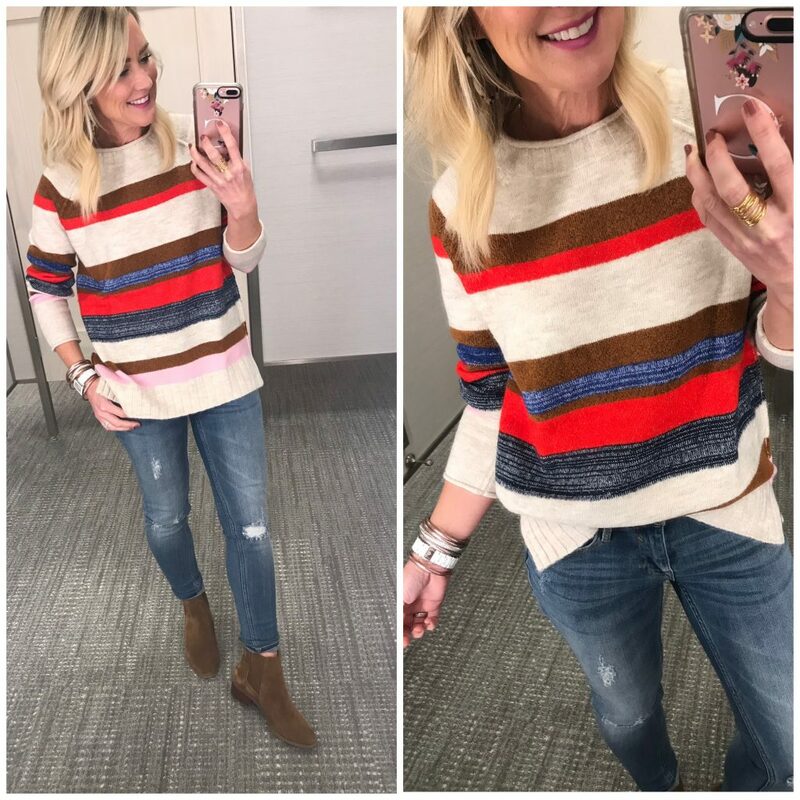 To see more finds from the dressing room, click here. Happy weekend, lovebugs! You’re not old to begin with, but the turtleneck fit & flare dress just took 10-15 years off of you! Very versatile dress, good pick! Well hello, guess I’ll be living in that dress now!!! Mary Poppins Returns was beautifully performed by Emily Blunt. You and Little Miss will love it! The heart pajamas are my favorite! I love emily blunt, too!!! If you love singing, dancing (and dancing bicycles!) and magic, you’ll all love Mary Poppins Returns. It’s enchanting. The red valentines tank is so cute and I love all of the color blocking sweaters and cardigans right now! Oh and that pom pom sweater might just be my favorite!!! 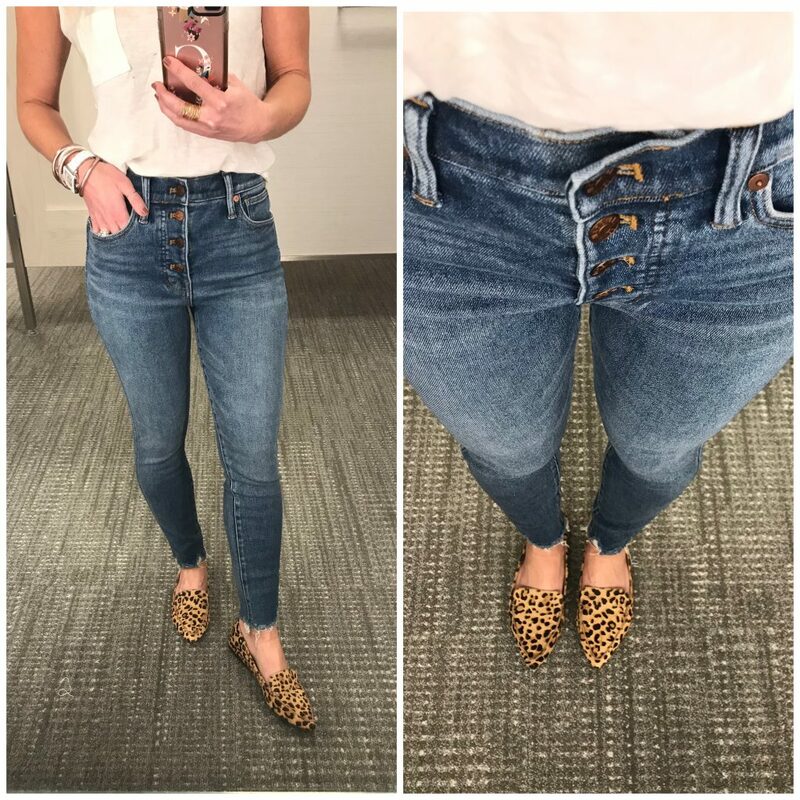 Could you address in one of your posts sometime, what are some options for women who may not have the legs for the “no hose look” that’s in fashion right now? Because, let’s face it, a lot of women’s legs/knees are not attractive uncovered! Opaque tights are a great solution for winter, but what do you recommend for the spring/summer months? Thanks, love all your posts and your fabulous sense of style…can’t wait to see your new collection on January 29th! Thanks so much, Lorie!!! I do love opaque tights in the winter, but am just not a fan of hose in the summer months. Maybe because I would literally have a heat stroke if I wore them in Texas. I use self tanner to give me the boost I need to feel confident showing my bare legs. It really smooths out problem spots and is so slimming! I loved Mary Poppins, Emily Blunt is amazing! It isn’t a remake but a sequel…enjoyable for sure! I took my daughter to see MP last week – she loved it! Ooops, sorry about that! It’s updated now! On the striped fleece pullover. Is that a front tuck or did you tuck in the back also because it is so long? Thanks! I front-tucked it…the back is just folded under a bit. Also I live in North Dallas so do you think this is light enough to wear through Spring? 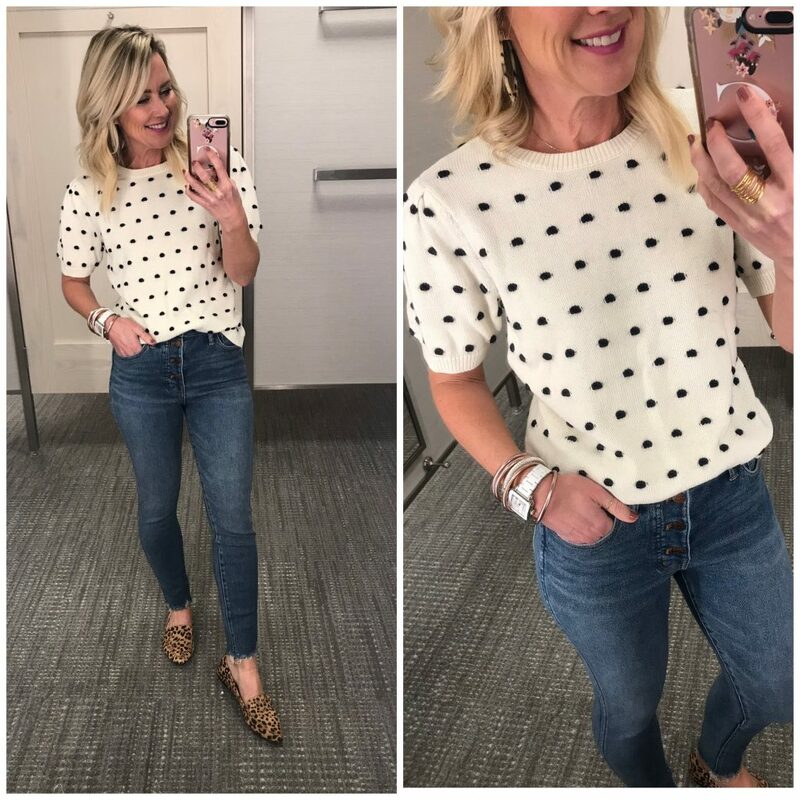 Yes, I’d size down…and def light enough to wear through Spring!